If you've ever felt guilty about letting kids play video games or watch tv, you can relax. This kids wobble chair keeps children and teens in motion, engaging their stomach and back muscles, working their legs and arms...almost as if they were running around the yard. Students can teeter, totter, jiggle and sway all day long and the non-slip rubberized bottom will ensure their stool stays under them. The cushioned top keeps their tushies comfy even when they have to stay in their seats for longer periods. They'll look forward to sitting down and getting to work when they know they'll be allowed to move around and fidget as much as their little energetic bodies need to. You'll immediately notice how much healthier this wobble stool is for children - all they'll notice is how much fun they're having. You can feel confident about giving this chair to your kids because you'll be setting them up for a much healthier life and body overall... Unlike standard chairs that bring out the worst in kids - slouching, rounded, twisted backs and spines that can cause pain later on. ★ STRENGTHENS CORE & CORRECTS POSTURE: Regular chairs allow children to slouch and encourage poor posture that can cause back problems later in life, but this wobble chair for kids ensures boys and girls maintain good posture while naturally engaging their cores for stronger, healthier backs. ★ HELPS FIDGETY KIDS WITH CONCENTRATION: Kids of all ages are naturally active, and this chair encourages the high energy child to get their wiggles out while remaining in their seat so their activities and studies get done. The best way to help ADD & ADHD kids handle sitting down for long periods. ★ SOFT CUSHION ON TOP FOR SITTING COMFORT AND FLEXIBLE SEATING: A comfortable cushioned seat allows your son or daughter to wiggle, wooble, move side-to-side, back and forth without fear of tipping over or landing on the floor. Their bottoms stay comfortable while they balance and work out their restlessness. 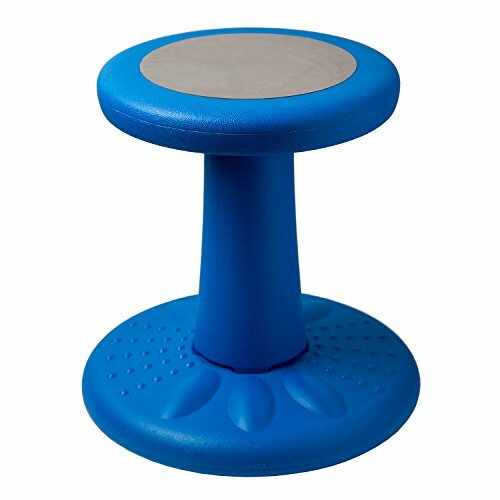 ★ NON-SLIP RUBBERIZED BOTTOM KEEPS CHAIR UNDER YOU: Energetic youngsters love this stool that transforms boring, sedentary sitting into calorie-burning activity. The constant movement keeps blood flowing to back and core. Both ergonomic and fun for kids who need to move constantly.